<?xml version="1.0" encoding="UTF-8"> Starcraft Copies Airstream? 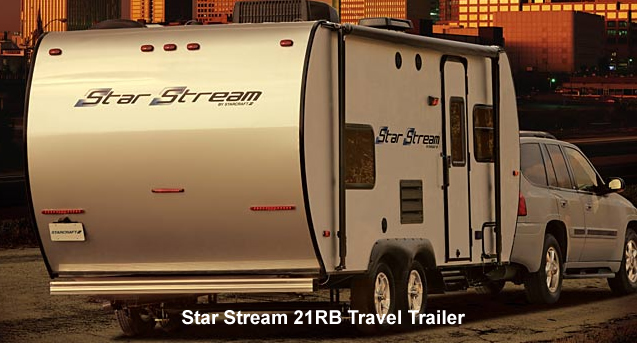 Starcraft RV has a new "Euro" look travel trailer and hybrid travel trailer called "Star Stream." 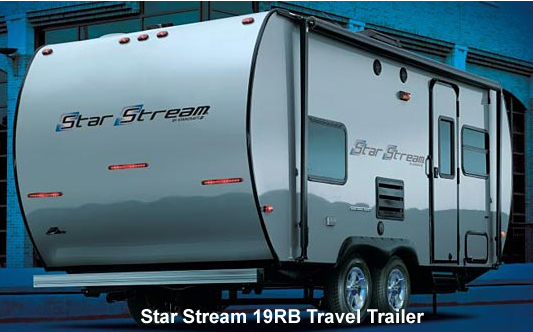 At first glance, the sleek polished aluminum skin reminded me of an Airstream trailer even though the skin color of the Star Stream wasn't the highly polished silver that is associated with the Airstream. Instead the Star Stream has a polished finish that reminds me of the pearl-like finish available on Lexus SUV's - very classy and upscale looking. But, I'm not a fan of the black accent trim. I think it breaks up the clean looking lines of the Star Stream and detracts from its elegance rather than adding to it. 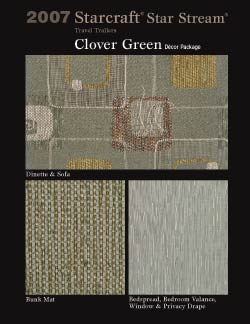 But, I am a huge fan of the interior decor packages available. 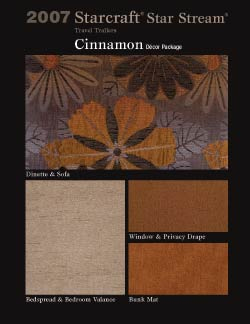 Instead of one or two available patterns that look like the only reason they were chosen was for their ability to hide dirt and stains, the three interior decor packages available on the Star Stream are updated and contemporary looking. 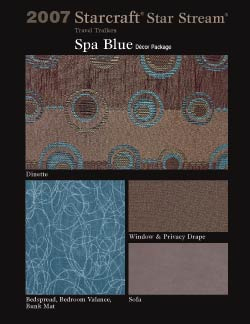 I especially like the "Spa Blue" option with its blue and brown color scheme and circle and line graphics. The expandable Star Stream has 2 floorplans. 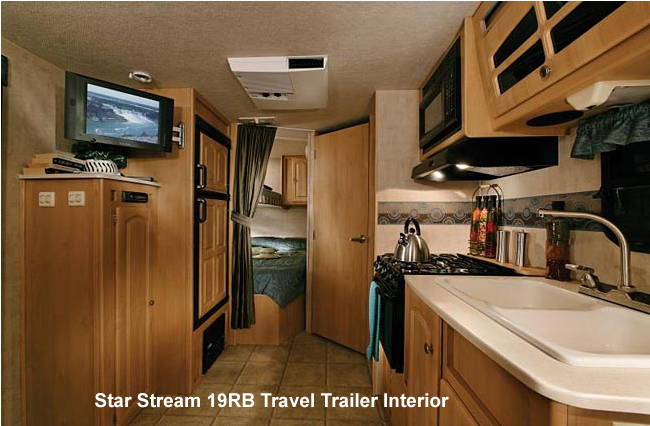 The Star Stream travel trailer has 4 available floor plans. Lengths range from 19 to a little over 27 feet. The sleek and curvy Euro design is not only on the outside of the travel trailers extends to the interior as well. Again it reminds me of the curvy and sleek Airstream interiors. There is interior accent lighting, an abundance of storage, a three burner black cooktop, all weather roofing, and has an i-beam steel powder-coated frame for durability. A few of my favorite options are the 15" swivel LCD TV and DVD player and the premium package which includes an awning, spare tire and carrier, AM/FM stereo CD player with outside speakers, TV antenna, microwave oven, gas water heater, Dometic double door refrigerator, aluminum wheels, Spray-Port exterior sprayer, and TV bracket. The cost of one of these beauties? 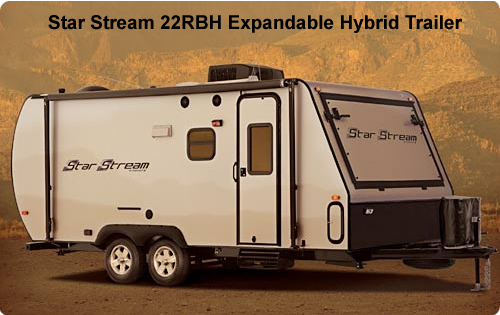 MSRP starts at just a little over $17,000 which is an attractive price (and a lot more affordable than the Airstreams I've been comparing the Star Stream to).